Mulch, mulch, mulch: The main issue with the heat is that plants seem to need more water, but this is always tough to balance with the worrying water situation. The best way to resolve this situation is to use good mulch, whether your garden is on the ground, or in containers. Straw or dry leaves can make very good mulching material, and you can get most of this from your garden waste itself. 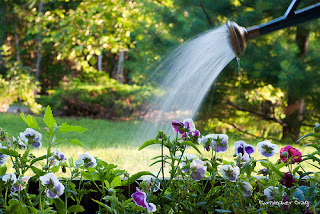 Watering: Once mulching is done, it is easier to assess watering needs. The mulch will conserve the surface water from drying up too soon, and in some cases even watering once in two days might be sufficient. Do check your plants twice a day though, because some plants might need extra care due to the high heat. Weeding: This is always an ongoing activity in any garden, but in summer you may find quite a few weeds coming up and crowding out the space. In some cases, you might be pleasantly surprised to find many edible weeds like clover and purslane that seem to grow out of nowhere and you can just pluck regularly and put them into your dal. Some weeds though have extensive roots that drink up all the water, and these need to be pulled up along with the root as soon as you notice them. Pruning: In a season where plants find it difficult to get water and nutrition, pruning dead or dying leaves and branches is a good way to help the plants thrive. By doing this, the plant does not need to waste energy on the older branches and leaves, and will look fresher and flower or fruit much better. Nutrition: This is something that’s important in every season, and especially in the case of kitchen gardens, some additional inputs during flowering and fruiting will give good results. After spending some time on your blog i thought i utilized my time in a correct way by reading coprrect blog.I appreciate your work.